The Public Service Officers Unit is comprised of employees formerly classified as Park Rangers, Downtown Service Officers, and Airport Service Officers. 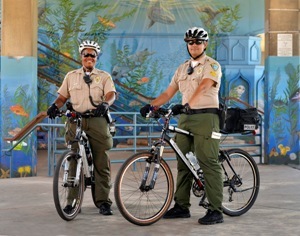 We have instituted a cross training program designed to integrate the former job classifications and maximize the benefit of these multi-faceted employees so that visitors to Santa Monica and the community can continue to receive the best possible service. The responsibilities of Public Service Officers include high visibility patrol with an emphasis on the parks, Santa Monica Municipal Airport, beach, and the downtown business district (3rd Street Promenade). They provide assistance to our international visitors, guidance to members of the community, and enhance our public safety efforts by observing, reporting and enforcing violations of municipal laws and ordinances. Public Service Officers' day to day duties may include traffic control, resolving minor disputes, street performer complaints, noise related issues, coordinating with the Federal Aviation Administration to ensure aircraft safety, addressing quality of life issues, responding to medical emergencies, issuing citations, and writing reports. Harbor Officers are responsible for responding to a variety of water and pier/beach related calls including boats or swimmers in distress, medical emergencies on commercial vessels, SCUBA diving emergencies and aircraft related incidents. They also maintain the navigation aid buoys that surround the pier breakwater as well as conduct underwater inspections of the pier support pilings. Harbor Officers are equipped with 28' rescue boat that is fitted with a fire monitor, salvage pump, SCUBA equipment, medical equipment as well as radar, RDF (Radio Directional Finder), GPS, depth sounder and marine & lifeguard radio. 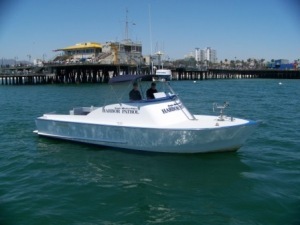 Regular patrols of the Santa Monica Pier are made on foot or in a 4 X 4 vehicle also equipped to patrol the beach and adjacent pier areas. Officers make high visibility patrols for public access regarding any emergencies or public safety issues and respond to minor and major medical calls on the pier and also beach areas that aren't easily accessible. USLA (United States Lifeguard Association) members in good standing, requiring an annual 500 yd. ocean swim. The Harbor Unit works and trains with several agencies including: Santa Monica Fire Department, Los Angeles County Fire/Lifeguards, Los Angeles County Sheriffs Harbor Patrol and the United States Coastguard.